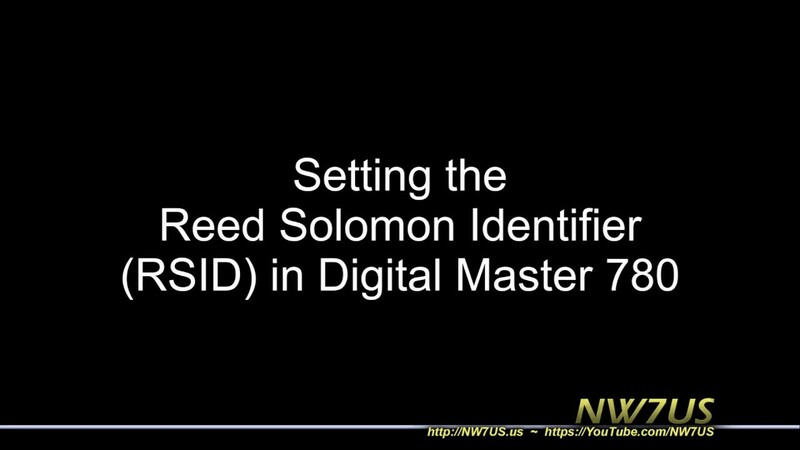 The link below is a video in which I demonstrate how to set the Reed-Solomon Identification (RSID) feature in Ham Radio Deluxe's Digital Master 780 module (HRD DM780). I encourage ALL operators in any digital mode such as Olivia, set the RSID feature on as shown in this example. In Fldigi, the RSID is the TXID and RXID (I believe). Please make sure you are using the RSID (Reed Solomon Identification - RSID or TXID, RXID) option in your software. RSID transmits a short burst at the start of your transmission which identifies the mode you are using. When it does that, those amateur radio operators also using RSID while listening will be alerted by their software that you are transmitting in the specific mode (Olivia, hopefully), the settings (like 8/250), and where on the waterfall your transmission is located. This might be a popup window and/or text on the receive text panel. When the operator clicks on that, the software moves the waterfall cursor right on top of the signal and changes the mode in the software. This will help you make more contacts! + 2nd Note: A problem exists in the current paid version of HRD's DM780: the DM780 RSID popup box to click does not work. HRD support is aware of the problem. You can still use the textual version that you can select in the settings so that it appears in the receive text areas. If you click the RSID link that comes across the text area, DM780 will tune to the reported signal, and change to the correct settings.